﻿In general we don't fry anything. 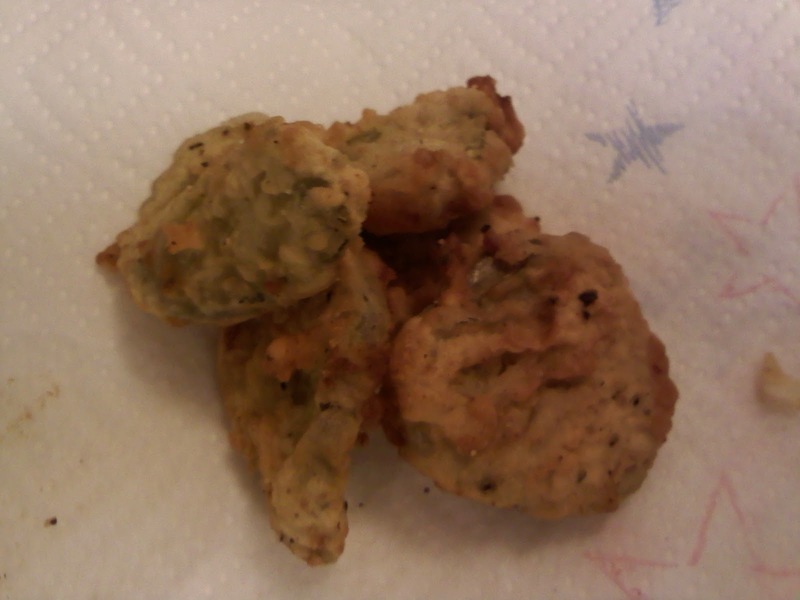 Fried pickles are a guilty pleasure best enjoyed at a bar on rare occasions. But last week my sister had a craving. I found the recipe. She did the deed. We took the recipe below and changed it up and added a lot of spices (hot sauce, seasoning salt, hot red pepper, etc) for our taste. In a small bowl, mix together the milk, egg, 1 T of flour and Worcestershire sauce. In a separate bowl, stir together the remaining flour and other spices. Heat oil to 350 degrees (we used a small saucepan). Dip the pickles into the milk, then the flour, then repeat both steps. Place pickles carefully into the oil. Fry until they float to the surface and are golden brown. Remove with a slotted spoon and drain on a paper towel. Serve with ranch dressing.